Two years ago, one of gaming’s greatest myths became a reality when a man named Terry Diebold unearthed the world’s only known prototype of the “Nintendo-PlayStation.” A Sony-created and branded machine, it was a hybrid Super NES that came with a CD-ROM built in, making it capable of playing both disc-based and classic cartridge games. But the alliance between Nintendo and its future console-war rival fell apart before the system ever saw release, and its existence was little more than a legend until Diebold found a half-working prototype in a box of junk he bought at an auction. The results are a little underwhelming on the surface—although Heck’s celebratory dance to, what we have to assume is, his interpretation of the Battletoads pause music was tremendous. Only one of the two fan-developed games booted up and it was a glitchy mess, but as Heck points out, these weren’t written by people with actual knowledge of the prototype’s hardware. The creators were programming based on a notion of how the system theoretically worked, so the fact that the game booted up at all is kind of amazing. Better yet, Heck later contacted the game’s creator, who figured out the problem and updated the code. After that, Heck says the game was working perfectly. 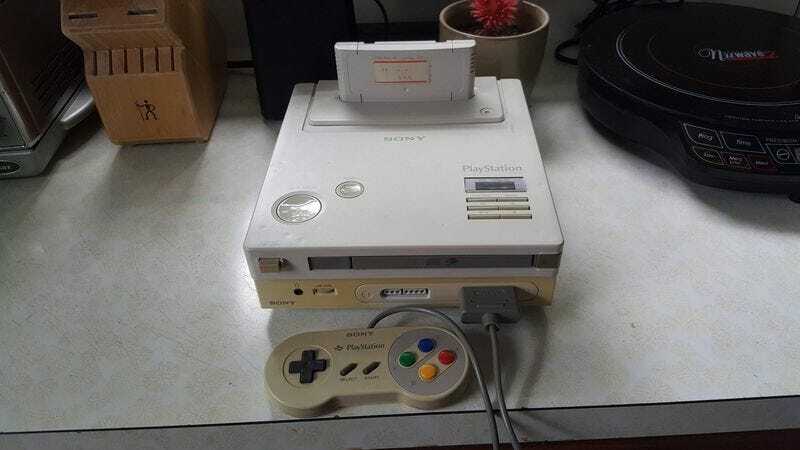 It’s one of those odd bits of gaming history that warrants repeating: This is the first time the public has ever seen a CD-ROM game running on a fully functioning Nintendo PlayStation, a machine that had been lost to history for nearly 25 years. What comes next, as Heck said, is up to the home brewers making games for it.